This product guide provides essential technical and pre-sales information on the Lenovo ThinkAgile HX7821 Certified Node for SAP HANA, its key features and specifications, components and options, and configuration guidelines. This guide is intended for technical specialists, sales specialists, sales engineers, IT architects, and other IT professionals who want to learn more about the ThinkAgile HX7821 Certified Node for SAP HANA and consider its use in IT solutions. The ThinkAgile HX7821 for SAP HANA is a 4U rack-mount certified node that supports four processors, up to 3 TB of 2666 MHz TruDDR4 memory, up to 76.8 TB of all flash storage capacity with NVMe PCIe cache acceleration, and network connectivity with 1/10 GbE RJ-45, 10 GbE SFP+, and 10/25 GbE SFP28 ports. The ThinkAgile HX7821 Certified Node for SAP HANA is certified by SAP for deploying SAP HANA solutions on hyperconverged infrastructure (HCI) in production environments. The ThinkAgile HX7821 Certified Node for SAP HANA is shown in the following figure. Certified to run SAP HANA in production on hyperconverged infrastructure. Built on proven and reliable Lenovo ThinkSystem servers featuring Intel Xeon Processor Scalable Family that provide compute power for SAP HANA workloads. The following figure shows the front view of the HX7821 Certified Node for SAP HANA. The following figure shows the rear view of the HX7821 Certified Node for SAP HANA. The following table lists the system specifications of the ThinkAgile HX7821 Certified Node for SAP HANA. Memory Up to 48 DIMMs. Support for 16 GB and 32 GB TruDDR4 2666 MHz RDIMMs, 64 GB TruDDR4 2666 MHz LRDIMMs, or 64 GB and 128 GB TruDDR4 2666 MHz 3DS RDIMMs. Memory capacity Up to 3 TB. 4 cache drives (NVMe PCIe SSDs) and from 8 to 20 capacity drives (SAS SSDs) in increments of 2 drives. Cache drives (NVMe PCIe 3.0 x4 SSDs): 1.6 TB. Capacity drives (12 Gbps SAS SSDs): 800 GB, 1.6 TB, 3.84 TB. Note: All cache drives in the certified node must be of the same model and capacity. All capacity drives in the certified node must be of the same type and capacity. Maximum storage capacity Up to 76.8 TB (20x 3.84 TB SSDs). Storage controller 2x 430-16i HBAs (12 Gbps SAS/6 Gbps SATA; non-RAID). Onboard NVMe (non-RAID). 2x or 4x 1/10 GbE RJ-45 or 10 GbE SFP+ network ports. 4x 10/25 GbE SFP28 network ports. Slot 7: PCIe 3.0 x8; low profile (not used). 1x RJ-45 10/100/1000 Mb Ethernet port for systems management. Power supply Four redundant hot-swap 1600 W (100 - 240 V) High Efficiency power supplies (80 PLUS Platinum certified). Video Matrox G200 with 16 MB memory integrated into the XClarity Controller. Maximum resolution is 1920x1200 at 60 Hz with 16 bits per pixel. Software Nutanix Acropolis Pro and Ultimate editions (licenses are purchased separately from Nutanix). SAP HANA (licenses are purchased separately from SAP). Hypervisors Nutanix Acropolis Hypervisor (Bundled with AOS; factory preload). Hardware warranty Three-, four-, or five-year customer-replaceable unit and onsite limited warranty with ThinkAgile Advantage Support and selectable service levels: 9x5 next business day (NBD) parts delivered or onsite response, 24x7x4 or 24x7x2 onsite response, or 6-hour or 24-hour committed repair (select countries). Also available are 1-year and 2-year post-warranty extensions, YourDrive YourData, and Premier Support. The following table lists the base CTO model of the ThinkAgile HX7821 Certified Node for SAP HANA. The ThinkAgile HX7821 Certified Node for SAP HANA ships with four processors. The following table lists the processor options that are available for selection. The ThinkAgile HX7821 Certified Nodes for SAP HANA support Lenovo TruDDR4 memory. TruDDR4 memory uses the highest-quality components sourced from Tier 1 DRAM suppliers and only memory that meets strict requirements is selected. It is compatibility tested and tuned to maximize performance and reliability. The ThinkAgile HX7821 Certified Nodes for SAP HANA support 24 or 48 DIMMs. Each processor has six memory channels, and there are two DIMMs per channel. The following table lists memory selection options available for the HX7821 Certified Node for SAP HANA. The ThinkAgile HX7821 Certified Node for SAP HANA provides 16x SAS/SATA and 8x AnyBay SFF hot-swap drive bays for configurable storage capacity, and it contains two internal M.2 SATA non-hot-swap SSDs configured in a RAID-1 drive group for software preload. The following table lists the internal storage options for the HX7821 Certified Node for SAP HANA. The following table lists the controllers for internal storage of the HX7821 Certified Node for SAP HANA. 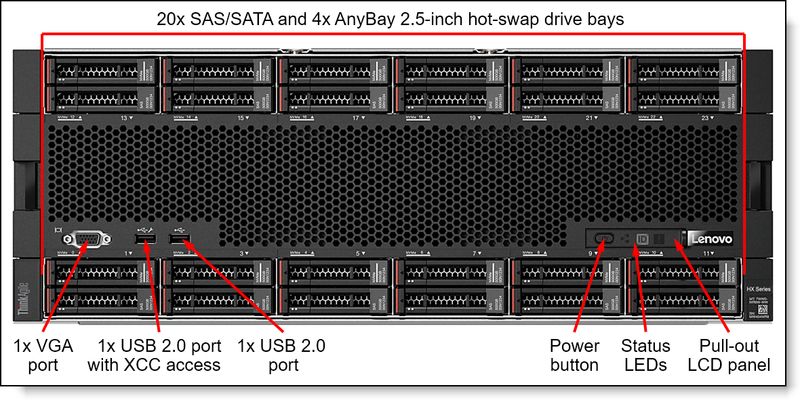 Two low profile SAS HBAs for internal storage provide 12 Gbps SAS JBOD (non-RAID) connectivity to the capacity SDDs; the SAS HBAs derived by the configurator, and they occupy the dedicated PCIe x8 slots on the compute and storage trays. The onboard NVMe interfaces provide PCIe 3.0 x4 JBOD (non-RAID) connectivity to the U.2 NVMe PCIe cache SSDs in the AnyBay drive bays. 2 cache drives: From 4 to 6 capacity drives in increments of 2 drives. 4 cache drives: From 8 to 20 capacity drives in increments of 2 drives. All capacity drives in the certified node must be of the same model and capacity. 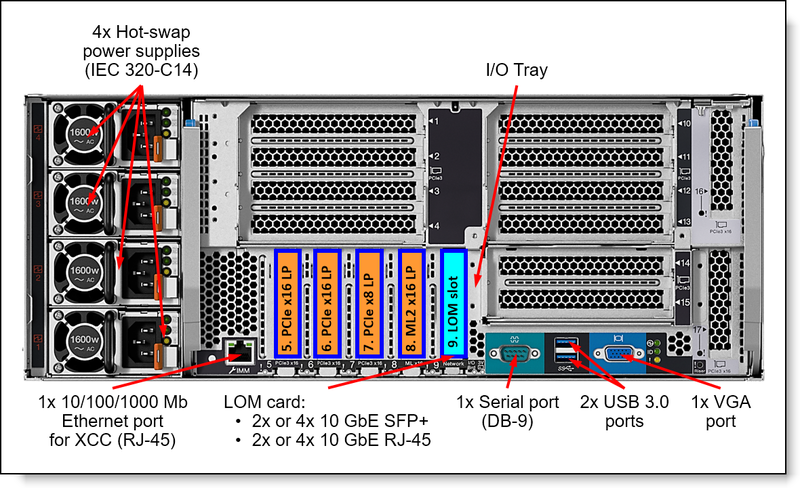 The ThinkAgile HX7821 Certified Nodes for SAP HANA provide two- or four-port 1/10 GbE RJ-45 or 10 GbE SFP+ network connectivity with the onboard Intel X722 NIC and a LOM card installed in the appliance. The nodes also provide four 10/25 GbE SFP28 ports with two Mellanox ConnectX-4 Lx dual-port adapters. The following table lists the network adapters. One of the 1/10 GbE RJ-45 or 10 GbE SFP+ LOM cards is required for selection. Two 25 GbE network adapters are derived by the configurator, and they occupy the PCIe slots 5 and 6. Supported transceivers or DAC cables should be purchased for the SFP+ or SFP28 ports, and UTP Category 6 cables should be purchased for the 10 GbE RJ-45 ports. The maximum number of transceivers or cables that are supported per adapter equals the quantity of the adapter ports, and all adapter ports must have the same type of the transceiver or cable selected. The following table lists cables for the 10 GbE RJ-45 ports. The following table lists transceivers and cables for the 10 GbE SFP+ ports. The following table lists transceivers and cables for the 25 GbE SFP28 ports. The ThinkAgile HX7821 Certified Nodes for SAP HANA ship with four 1600 W (230V) High Efficiency hot-swap power supplies listed in the following table. The ThinkAgile HX7821 Certified Nodes for SAP HANA ship with four customer-configured power cords. The following table lists the rack power cables and country-specific line cords that can be ordered for the HX7821 Certified Nodes for SAP HANA. The HX7821 Certified Nodes for SAP HANA ship with the rail kit shown in the following table. The ThinkAgile HX7821 for SAP HANA supports the Nutanix AHV hypervisor (bundled with AOS) that is factory-preinstalled on the 2x 128 GB M.2 SSDs configured in a RAID-1 drive group. The HX7821 Certified Nodes for SAP HANA can be deployed as a cluster of 3 or more nodes (AOS 5.9 or later). SAP HANA software licenses are purchased separately from SAP. Also, SUSE Linux Enterprise Server or Red Hat Enterprise Linux Server licenses are needed for deploying virtual machines for the SAP HANA virtualized environment. Optional Lenovo Professional Services are available to deploy SAP HANA software stack at the customer site. Lenovo solution support team works closely with SAP and is dedicated to troubleshooting the SAP HANA software and hardware issues and can coordinate any cross company support functions (SAP, SUSE, Red Hat, Nutanix) that may be necessary to resolve the problem as soon as possible. The SAP HANA onsite deployment that is provided by Lenovo Professional Services is optional for the ThinkAgile HX Certified Nodes for SAP HANA. PowerShell, Windows PowerShell®, and Windows® are trademarks of Microsoft Corporation in the United States, other countries, or both.